Seared tuna is a sea-foodies filet mignon. It's filling, it's decadent, it's meaty, and most like it rare. I truly cannot remember how I came up with this recipe. I don't remember ever researching seared tuna recipes. I don't remember ever eating a similarly prepared tuna steak in a restaurant. 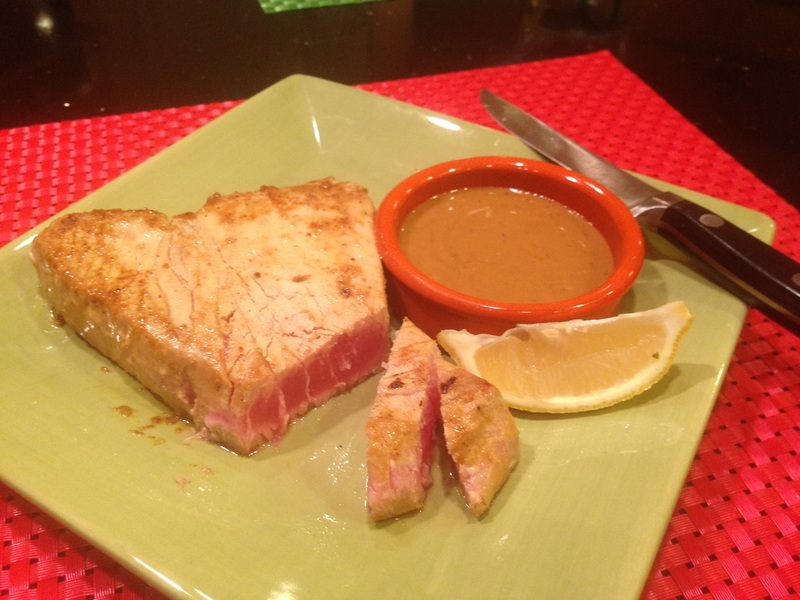 I honestly don't even remember when the first time I made this ginger dijon tuna was. Seared tuna is one of the things I skim every restaurant menu for first and I end up ordering it frequently. It's almost always prepared in an asian style so the soy sauce in the recipe is a no brainer. Lemon juice is a staple seafood accompaniment; if ever I end up with a fish dish that's lacking, a squeeze of citrus nearly always brings it back up to par. I remember once having a too small bottle of wasabi mustard in the fridge and thinking it would be good as a marinade for tuna and if wasabi mustard would be good than dijon must also be good... right? Right. Note the use of sesame oil in this recipe. Other cooking fats will do in a pinch, especially because the tuna isn't spending much time in the pan anyway, but sesame really brings home that Asian nuttiness. Plus, it has a high smoke point. If you heat oil past smoke point it starts to deteriorate and release chemicals that give food that inedibly burnt taste. This recipe is grain free, paleo and dairy free. Combine mustard, lemon juice, soy sauce, ginger, and pepper and whisk together. Use half to marinate the tuna for at least one hour. Save the rest to use as a dipping sauce. Add oil to a pan (or brush it on the grill- even better) over medium/high heat and allow to warm. Once the oil is hot, add the tuna to the pan. Sear tuna steaks on each side for about 2 minutes or until a golden brown crust just begins to form. Remove the tuna from the pan and cut into ¼ inch slices. Serve alongside remaining marinade to be used as a dipping sauce.